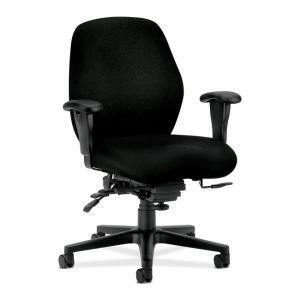 Mid-back task chair features deeply contoured foam that supports the body for all-day comfort. Control options encourage good posture. Curvilinear back has pronounced lumbar support. Other features include an integral headrest, shoulder-height recess to cradle upper spine, wave-formed seat to provide a natural "settling in" place, fully upholstered outer back and five-star base with hooded, dual-wheel casters. Functions include pneumatic seat-height adjustment, back height adjustment, seat glide mechanism, 360-degree swivel, tilt, tilt tension and asynchronous control. Arms adjust in height and width and have super-soft arm pads for maximum seating comfort. Mid-back chair is certified by SCS to be in compliance with specific indoor air quality emission requirements. Meets or exceeds applicable ANSI/BIFMA standards. Available in black frame only.